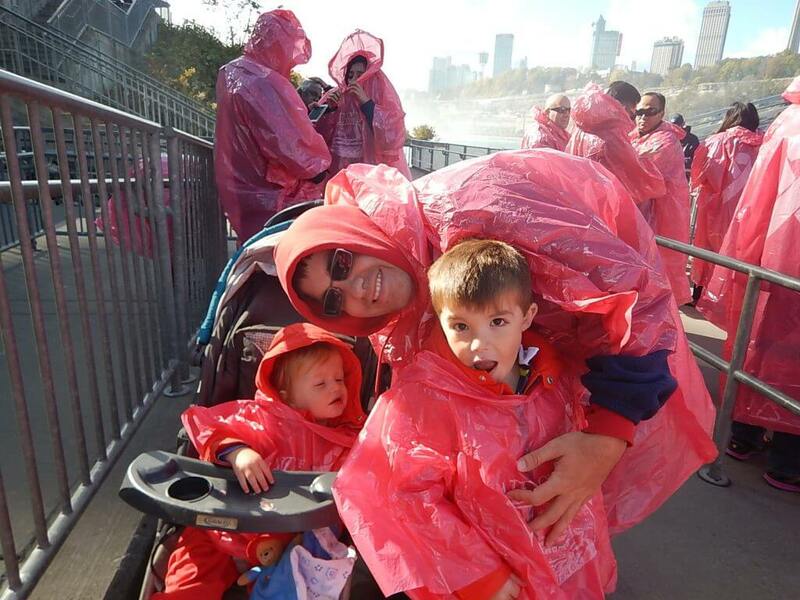 We just got back from a fantastic trip to Niagara Falls with our two kids. It was somewhere that has been on our Family Travel Bucket List for a while now, and I was so excited to finally be able to see the Falls! 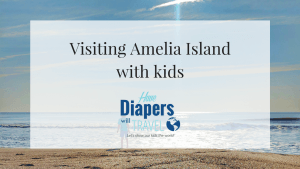 When we booked the trip, I really wondered how much a 4-year old and an 18-month old would get out of a vacation where the main attraction was just a very big waterfall, and if they’d find the trip as incredible as I knew that we would. Well, spoiler alert, our 18-month old Grayson was pretty unimpressed with the falls (he literally fell asleep on the Maid of the Mist boat ride!) 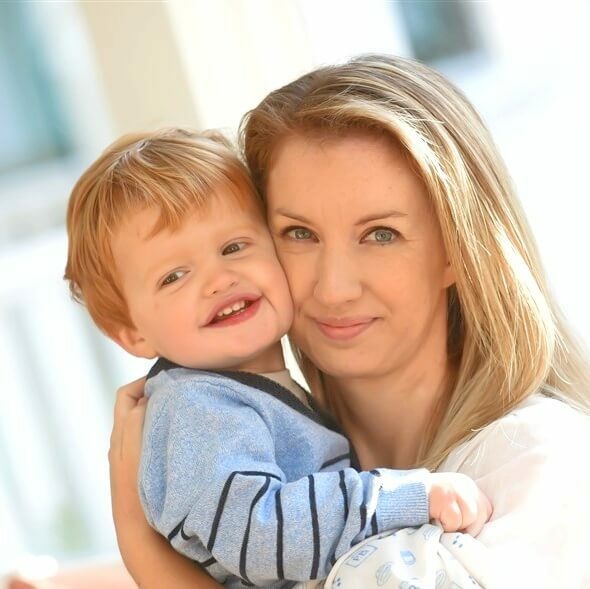 but our 4-year old Harrison was absolutely blown away by the experience, and loved every minute of the trip. There were a few things we were unable to do on this trip because we arrived at the end of the season, but for the most part, we got to see a lot in the short time we were there. 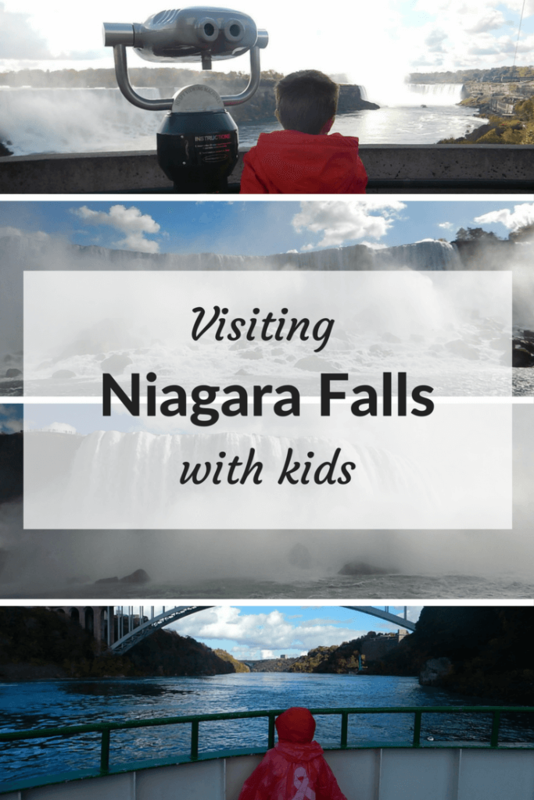 Here’s my guide for everything you need to know about visiting Niagara Falls with kids. Probably the easiest and cheapest way for most people to get to the Falls is to fly into Buffalo International Airport (BUF), about a 30 minute drive away from the Falls. Most major airlines fly into Buffalo, including Soutwest, JetBlue, United and American; we flew in with American via Philadelphia, and found the airport to be really nice, with plenty of places to eat and shop. 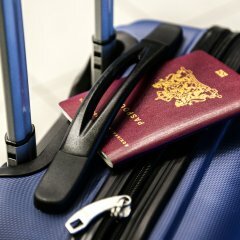 If you’re traveling from overseas, you’re probably better flying into Toronto International Airport, which is located about an hour and a half to the North of the Falls, as this airport is more likely to serve international carriers. You can also fly into the major New York City airports, which are around a five to six hour drive from the Falls, depending on traffic. Bear in mind that you will need identification to cross the border from USA to Canada, and this will vary depending on your nationality. Alternatively, the Niagara Falls International Train Station is connected to all major US and Canadian cities. There are numerous places to stay on both the American and Canadian side, with everything from major hotel chains to quaint little Bed and Breakfasts. We chose to stay on the Canadian side, since we were told that these hotels offer the best view of the Falls. 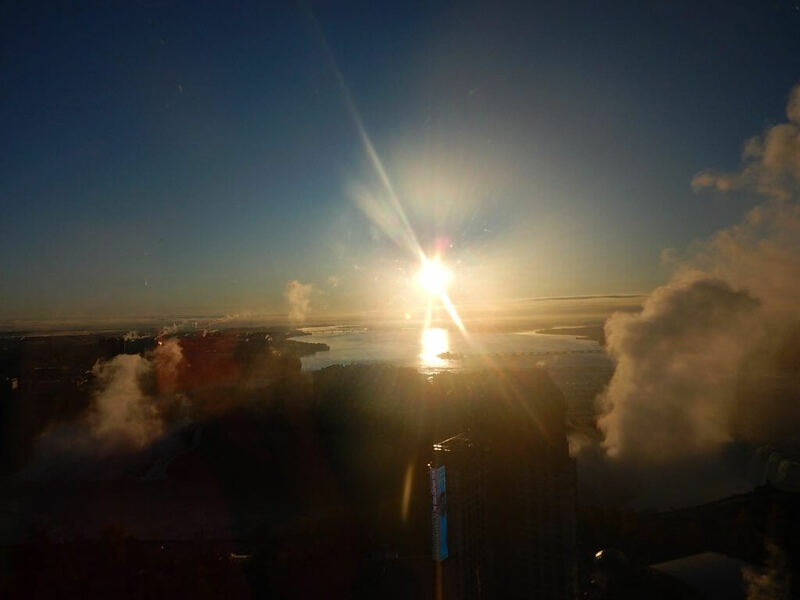 We stayed at the Hilton Niagara Falls Fallsview, where we stayed in a 2-bedroom suite with a view of the Falls on the 49th floor. I cannot say enough good things about this hotel; it was absolutely perfect, and the view of the Falls was breathtaking! We were able to look over the American Falls as well as the Canadian Falls with literally only one other building between us and the water, and since we were facing East, we were able to see the sunrise over the Falls as we sipped our coffee (because if your kids are anything like ours, you will a) be up for the sunrise every day, and b) drinking coffee before you do anything else!) The hotel had fantastic restaurants, including an amazing buffet breakfast and an Italian restaurants where kids eat for free, and it was less than a five minute walk down to the Falls. If this is your first trip to Niagara Falls, and you’re looking for that spectacular, wow-factor view, then this hotel will not disappoint! Read through my full hotel review here. The easiest way to get around Niagara Falls is on foot. Both the Canadian side and the American side of the Falls are very easy to explore on foot, and you can walk across the Rainbow Bridge to get from one side the other (just remember to bring that identification with you). We had our stroller with us and found everywhere to be very accessible, with elevators and ramps when needed. 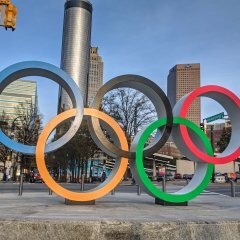 If a lot of walking isn’t an option for you, or you think the weather might not be right to be out in the open that often, then I would suggest renting a car. Not only will this allow you to easily get from the airport to Niagara Falls without having to worry about a taxi or a bus, but it will give you a little more freedom with exploring the area. We rented a car since we would be driving from Niagara Falls to Long Island later on in the trip, and did use it on more than one occasion when it was pouring with rain. We did find that the signage and the roads were sometime a little confusing, so if you have a GPS or app on your phone, I would recommend using them. I really think that the best way to explore Niagara Falls is on foot. We walked around both the Canadian side of the Falls and the American side, and found ourselves constantly stopping to admire the incredible views. 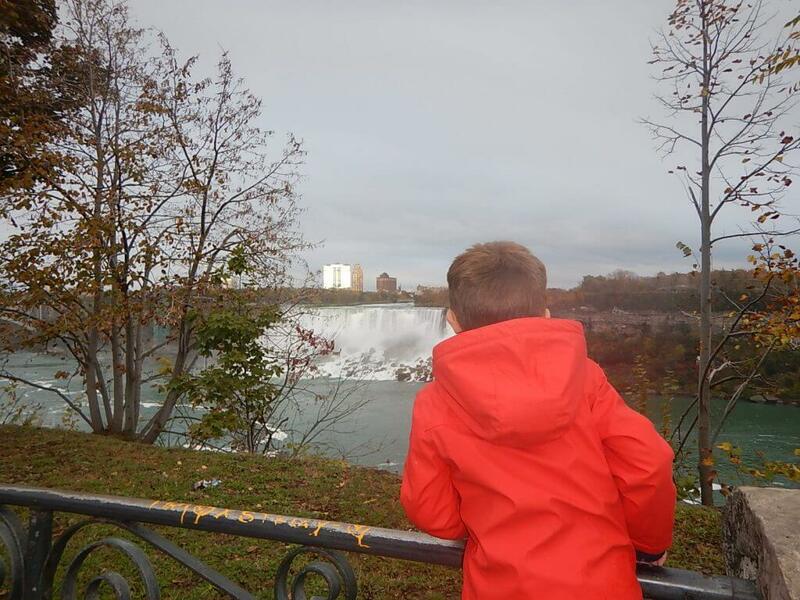 Harrison loved overlooking the Falls, especially the incredibly powerful Canadian Falls, and we found several spots with viewers to see the Falls a little closer. 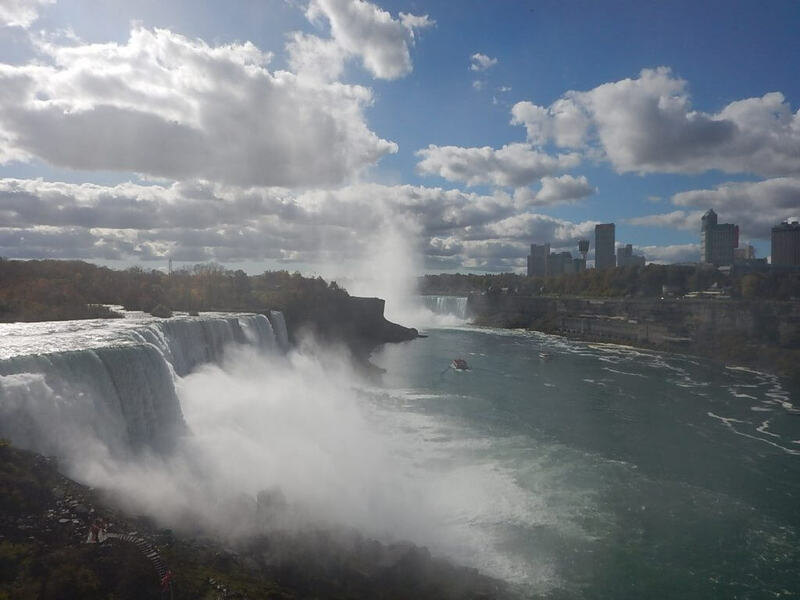 The Canadian side is more built up, with the majority of the viewing along one major roadway, and it is the best place to get a good look at both of the Falls together (and a great place to take panoramic pictures!) The American side doesn’t offer those same views, but you are an awful lot closer to the Falls (I mean, basically standing right next to them!) and you’re even able to walk back to see where the Falls begin. There are bridges where you can get really up close to the Falls; since we were getting in the car to begin an eight hour drive, no one was willing to get as wet as you get on these walks (and you get WET!) but they certainly offer incredible views. 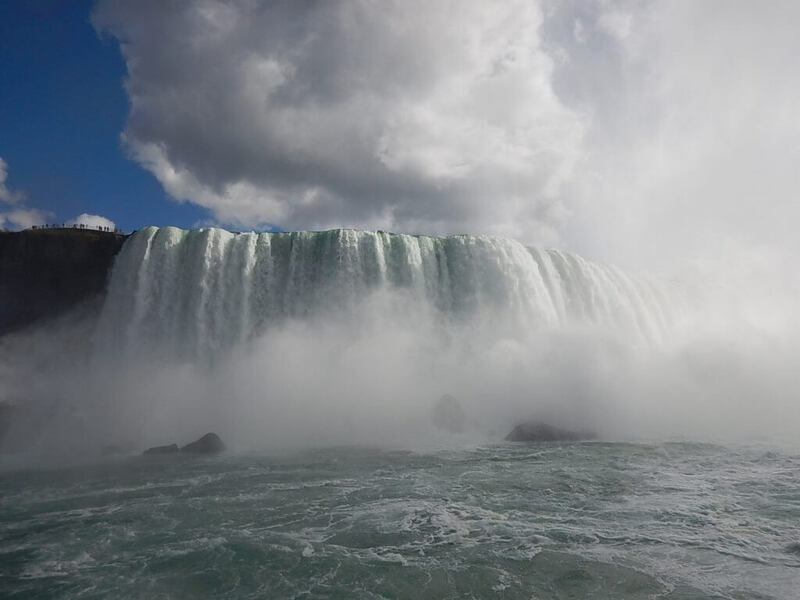 I don’t know anyone who has visited Niagara Falls and not been on the Maid of the Mist boat trip – seriously, I don’t know anyone, I think it must be compulsory! The Maid of the Mist is the world famous boat trip that takes you past the American Falls, and actually into the Canadian Falls; you get about as up close and personal as it is possible to get, and truly get to experience just how powerful those Falls are. 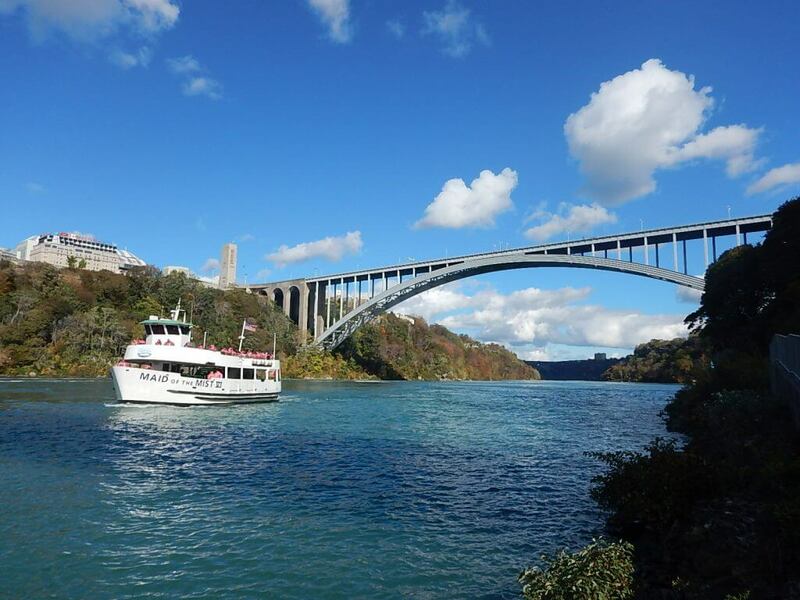 The Maid of the Mist is on the American side, and tickets can either be bought in advance or at the ticket window. We bought our tickets online for convenience sake, and our tickets were valid for any time in 2017 (this works out great if you’re going to be visiting the Falls for more than one day, and want to wait and see what the weather is going to be like). Kids under six don’t need tickets, meaning both of our kids got to take the trip for free! Trips take about 15 minutes, and run continuously throughout the day. Once you present your tickets, you’re directed to an elevator that takes you from the clifftop down to the water level. There you are given a complimentary poncho, and you wait to board the boat. These ponchos are more dollar store than deluxe, and although they are certainly better than nothing, you will still get wet on this trip! There is pretty much nowhere to hide on the boat either; you are able to take a stroller on board the boat and park it on the lower level, but you might want to cover it up or it will get wet too! The kids ponchos covered our kids pretty well, but my feet got absolutely soaked! If you really want to avoid as much of the water as possible, consider wearing a rain jacket and rain boots as well – you can read through my recommended rain gear for travel here. The trip begins by passing the American Falls, which are beautiful close up, as well as the smaller Bridal Veil Falls next door. We only got mildly wet as we passed these Falls, but once we actually entered the Canadian Falls, or Horseshoe Falls as they are officially known, it was like being in a torrential downpour! The power of the water really was incredible, and you could truly appreciate the size of the Falls when you’re right in front of them. It was truly worth getting soaked in order to get that close, and for once in his life, Harrison was stunned into absolute silence! He has talked nonstop about this boat trip and how powerful the Falls were since getting back from Niagara Falls, and I really think this trip made the Falls more ‘real’ for him; looking at them from a distance was great, but getting to be that close to them really helped him appreciate how incredible they were. Grayson on the other hand slept peacefully all snuggled up in his poncho through the whole trip, so I would say that while even young kids would enjoy this trip, 18-months might be a tad too young to truly appreciate it! Visit the official Maid of the Mist website to find out current pricing and schedules for the boats. Feel like doing something different? How about zip lining over Niagara Falls?! Wildplay are a company that offer a few different thrill experiences at Niagara Falls, and this was the one we chose. While my kids were too young for this, we saw multiple other kids trying this out and having the most amazing time! You take a zip line right alongside the Falls, literally over the water, as you descend from 220 feet above the ground at speeds of up to 40 mph over a distance of 2200 feet. My husband gave it a try, and absolutely raved about it; he said the experience of flying over the water like that was exhilarating, and the views were spectacular! Harrison watched his daddy with jealousy, and I know this is something he’ll want to try out next time. 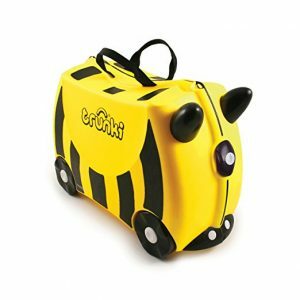 If you have little daredevils (or big ones!) in your traveling party, this is something you should definitely consider. If you can drag yourself away from the incredible natural splendor of the Falls, there is a lot to do in the surrounding area. 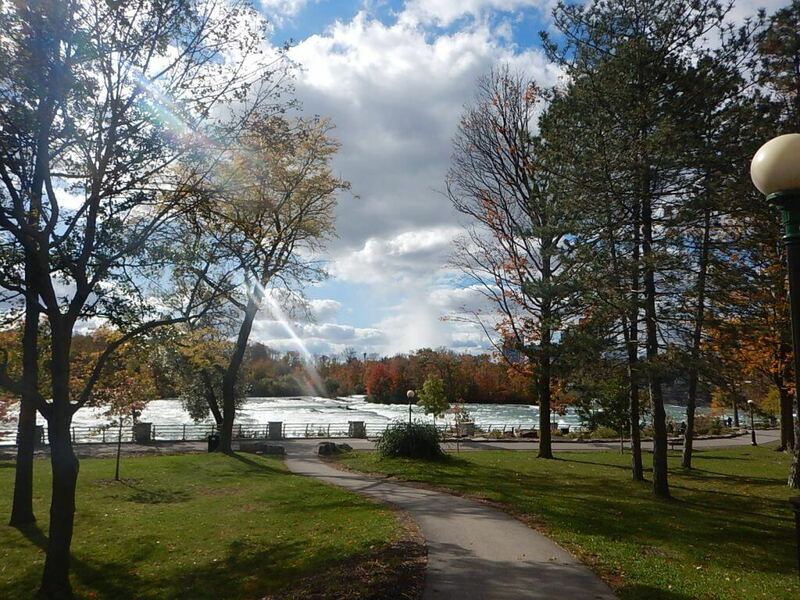 Visit the Aquarium of Niagara in Clifton Hill (where there are multiple places to eat and shop), take the Cave of the Waves tour to get up close and personal with Bridal Veil Falls, or get out there and explore the various hiking trails. We spent 48 hours visiting Niagara Falls with kids, and found more than enough to do. Our hotel was right across the street from the Fallsview Casino Resort, which not only housed a casino, but a huge shopping mall and multiple restaurants. We really enjoyed the food at the Canyon Creek Chophouse; the food was outstanding, they had a fantastic kids menu and our kids were made to feel more than welcome, and the tables by the window had a great view of the Falls. Our hotel also had a great Italian restaurant, Pranzo Ristorane Italiano, where kids eat free, as well as Brasa, a Brazilian Steakhouse. 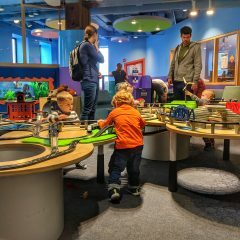 In the Clifton Hill area, you can find a Rainforest Cafe, which is always a great place for families, as well as Boston Pizza, and multiple chain restaurants. 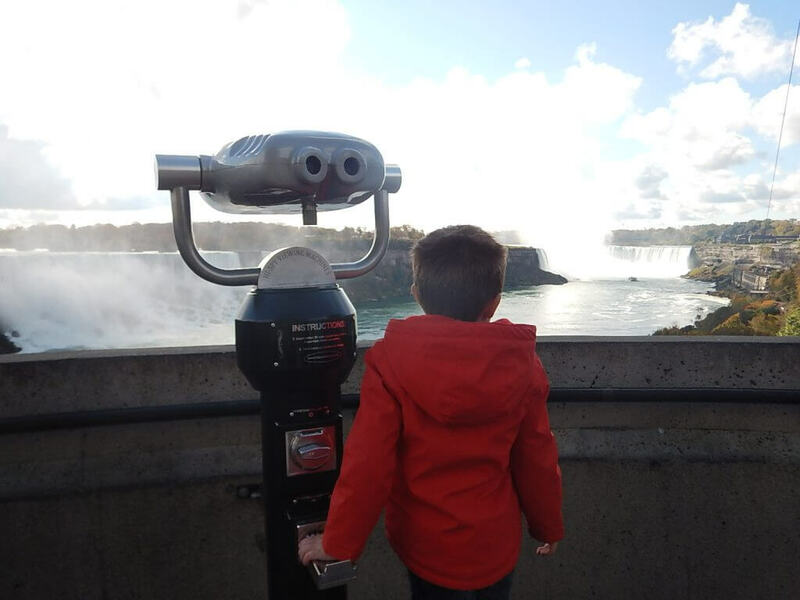 Have you visited Niagara Falls with kids? 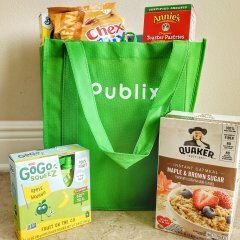 What other tips do you have? Let me know in the comments. 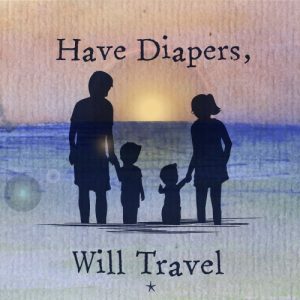 We are heading this way at the weekend with two kids so thanks for these tips. Have a great time! I bet it’ll be an awful lot warmer than our trip!